← Democratic Wedding: “Rick and Teresa’s Day” in Connecticut….. Same Day Registration (SDR) — the new law enabling residents to register and vote on election day — will be the topic for the Democratic Town Committee’s (DTC) August meeting to be held August 15th at 7 pm at New Britain City Hall. Public Law 12-56 took effect July 1st and “permits anyone to register and vote in person on Election Day if he or she meets the eligibility requirements for voting in this state and is (1) not already an elector or (2) registered in one municipality but wants to change his or her registration because he or she currently resides in another municipality.” By law, a person is eligible to register and vote if he or she is (1) a U. S. citizen, (2) age 18 or older, and (3) a bona fide resident of the municipality in which he or she applies for admission as an elector (voter). The voting rights law was enacted in the 2012 session of the Connecticut legislature, opening ballot access to unregistered persons on Election Days provided they document their residency and state in the town in which they wish to vote. Democratic Registrar of Voter Juan Verdu is preparing to implement SDR for the November 5th Municipal Election. Same-Day Registration and voting by new voters will occur at New Britain City Hall November 5th — effectively adding a polling place for residents not previously registered in the city. While SDR is now law in CT, voter registration efforts will continue through the regular mail-in registration deadline of October 22nd. New voters registering by the mail-in deadline will vote at the polling place in their own voting district. The Town Committee will endorse a new candidate for Board of Assessment Appeal to fill a vacancy on the slate endorsed in July. Convoy of Hope New Britain is a collaborative effort from local churches, town, community organizations, and businesses to help struggling inner-city families in and throughout the New Britain Region. This event will be held on August 17, 2013 at the Rock Cats Stadium, New Britain, and will feature medical and dental services, haircuts, distribution of over 20 tons of groceries, family portraits, a kids’ fun zone, food, live entertainment, back-packs filled with school supplies, and much more. Black Dems’ Soul Food Fest 2013: Club President/Alderwoman Shirley Black and State Party Treasurer Emma Pierce invite all to the annual Black Democratic Club’s Soul Food Fest 2013 featuring traditional southern cuisine. $15.00 per plate. The menu: Chicken, Ribs Macaroni & cheese, Collard Greens, String Beans, Sweet potatoes, Corn Bread and Cakes/Pies/Cobbler. The event will be held from noon to 3 p.m. at the Pride of CT Lodge of Elks, 24 Elm Street. New Britain’s Annual Dożynki Festival sponsored by the Polish American Council of Greater New Britain will be held at Falcon Field, Farmington Avenue (near Pulaski Middle School) on Saturday August 17th and Sunday August 18th. The Connecticut Citizen Action Group (CCAG) is planning a fund-raising barbeque on Saturday, August 17th from 3 to 6 p.m. that will include a “roast and toast” for former Ward 4 Alderman/Mayoral Aide Phil Sherwood & Dean Fleno who are re-locating to New Hampshire. The event will be held at the home of State Rep. Peter Tercyak, 150 Belridge Road from 3 to 6 p.m. 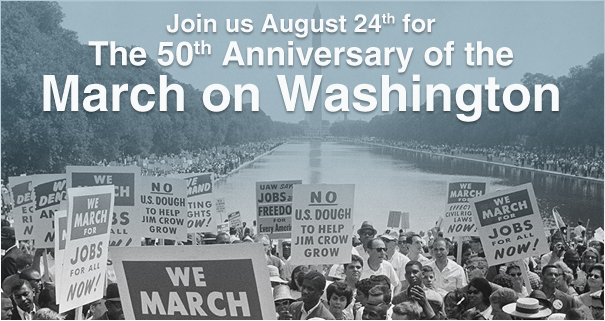 The United Auto Workers (UAW) Region 9A and the New Britain Branch of the NAACP are organizing busses to attend 50th Anniversary March on Washington on Saturday, August 24th. This month is the anniversary of the civil rights march in August 1963 when the Rev. Martin Luther King, Jr. delivered the “I Have A Dream” speech. The recent Supreme Court ruling weakening the Voting Rights Act of 1965 and issues surrounding the Trayvon Martin case have put issues of racial and social justice in the forefront again. Ryszard Schnepf, Poland’s Ambassador to the U.S, toured shops and restaurants on Broad Street on August 3rd. Schnepf was accompanied by U.S. Senators Chris Murphy and Richard Blumenthal, Cong. Elizabeth Esty, Mayor Tim O’Brien, State Senator Terry Gerratana and other elected officials and community leaders. 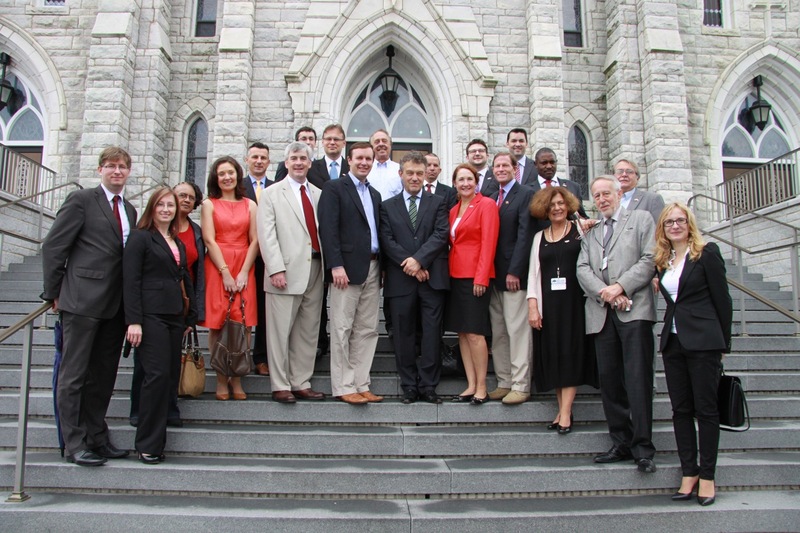 The walking tour paused on the steps of Sacred Heart Church for a photo. 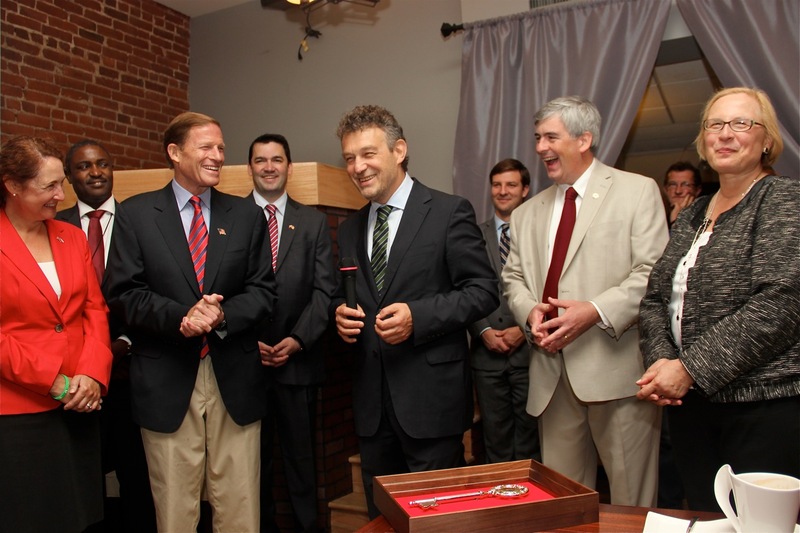 Ambassador Schnepf accepts a “key” to New Britain’s “Little Poland”. Looking on are Cong. Esty, Senator Blumenhal, Attorney Adrian Baron, Mayor O’Brien and Senator Gerratana. Ambassador Schnepf was in New Britain to speak at a Quo Vadis conference at CCSU. This entry was posted in Blumenthal, Chris Murphy, Civil Rights, Election Day, Elizabeth Esty, Hard Hittin' New Britain, Rock The Vote, Tim O'Brien. Bookmark the permalink.